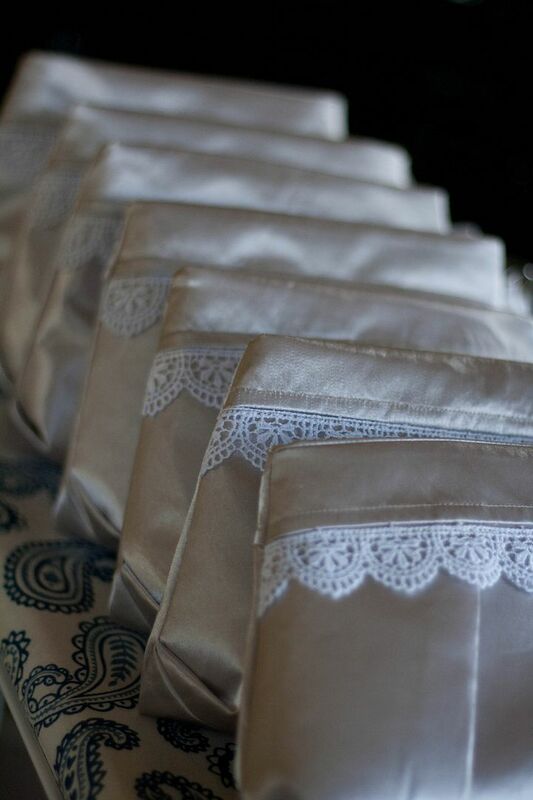 My brother-in-law is getting married this summer and his fiance ordered a set of custom clutches for her bridal party! 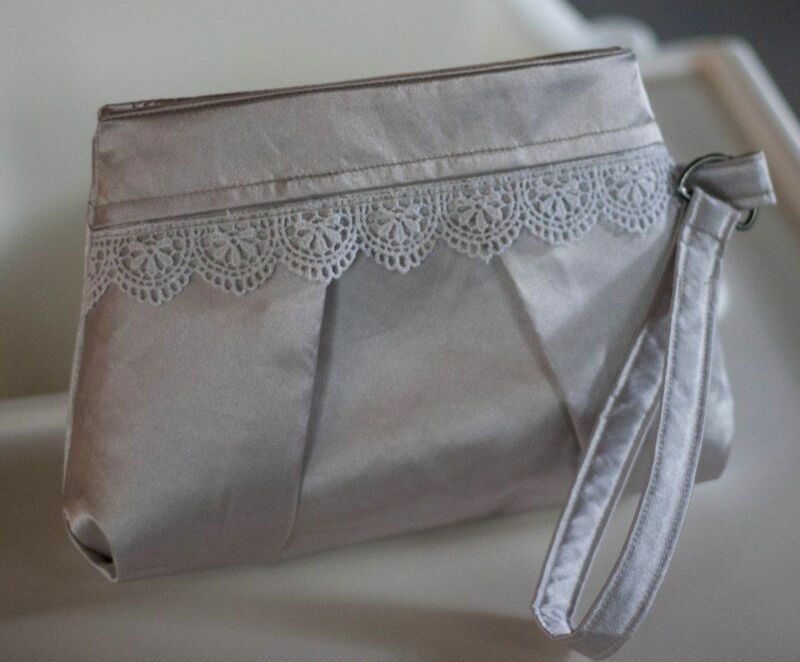 We both loved this Pleated Wristlet Pattern by Michelle Patterns so I picked up some silver satin and lace and got busy. These were pretty straightforward to make and I made pretty good time by doing them assembly-line style. The shape is a little different than I expected based on the pattern pictures, but I'm still super happy with how they turned out. And I found a wonderful trick. It's called a "walking foot." So, yeah, not really a trick, you can buy one pretty much anywhere. :) But if you are sewing anything slippery (or stretchy) it seriously makes a world of difference in how straight & even things turn out. I may never take it off my machine. But back to the clutches. They all had to match from the outside, but I wanted to make each one unique and make sure the girls could tell them apart. So I used a different fabric from my scrap pile for each lining to add a little fun! I also used a different color zipper for each one. 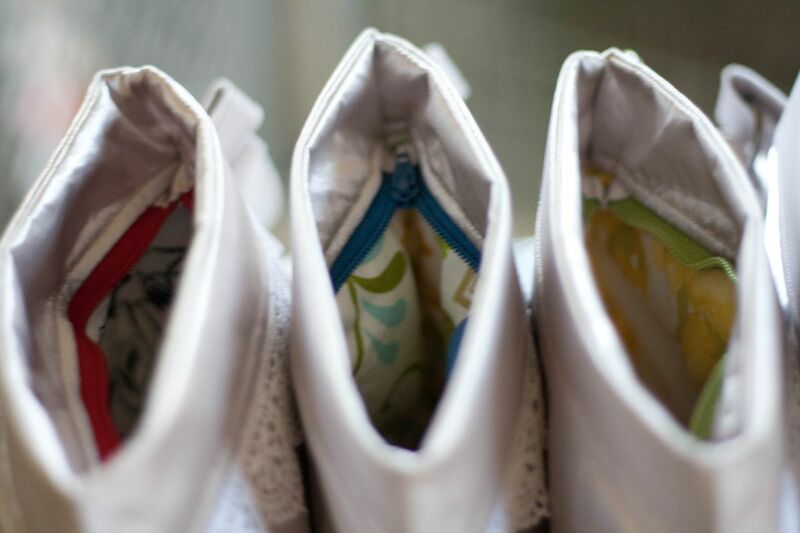 They are hidden by fabric flaps so they won't show during the wedding, but the girls will be able to tell them apart without unzipping them. The top middle one is my favorite! I'm going to try one of the bigger sizes of the pattern to make one for myself (I think it will be really handy when I'm wrangling Baby B), hopefully using the rest of my favorite fabric ever that I've been hoarding for years. It's time. (it's the fabric I used for the pillows in the first picture here) Hey, I actually kept it pretty short and sweet today! ;) Come back tomorrow to see the awesome new beach bag I made! Seriously. It's awesome. What have you been sewing lately? Or if sewing isn't your forte, what have you been crafting? Pretty straight forward? They look complicated to me. Good job! You are so talented! The purses are so cute! Cute! I love that each one is unique with the zipper and fabric inside. I was busy with baby blankets but now I am switching focus to getting things finished for school and decorating my last few boards. Crochet baby blankets, I assume? I bet they look awesome! I don't know how you do that. :) Hope the school decorating is going well and you are having fun with it! 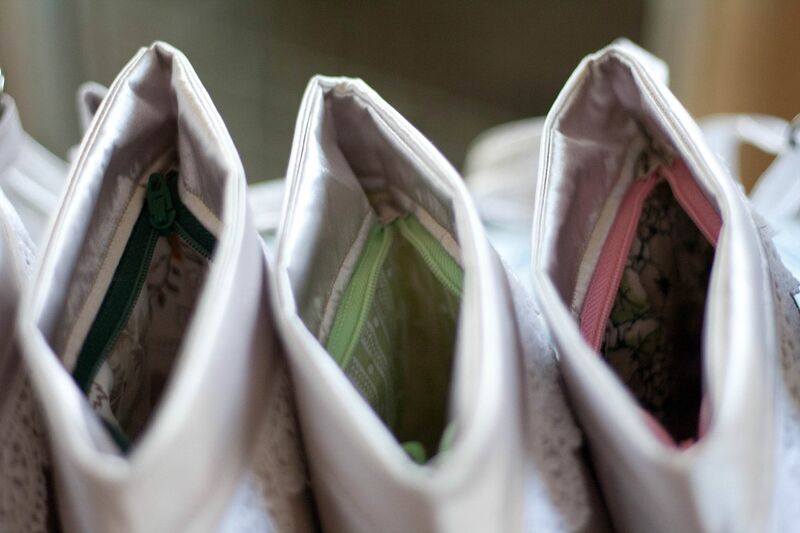 I am so excited to see these beautiful clutches in person ! I am thrilled to see so many young women sewing and loving it! I was afraid it was a lost art! Great job . I love your blog! It reminds me of raechel's blog . Thanks! I actually have a lot of fun doing it, it's my favorite hobby! I'm glad you are enjoying the blog. And I read Raechel's too!